As part of their Analytics package, Google now offers an A/B Testing tool, which can help increase your site's conversion rate. 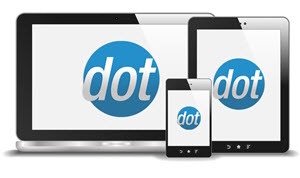 The tool allows you to set up multiple versions of your website's landing page. Customers who visit your site are each randomly presented with one of the versions, and their conversion rates are tracked to see which version tends to lead to more sales. Because you can specify a skin to use with the 'skinid=#' querystring, we can use this tool to help you choose between entire skins instead of just landing pages. 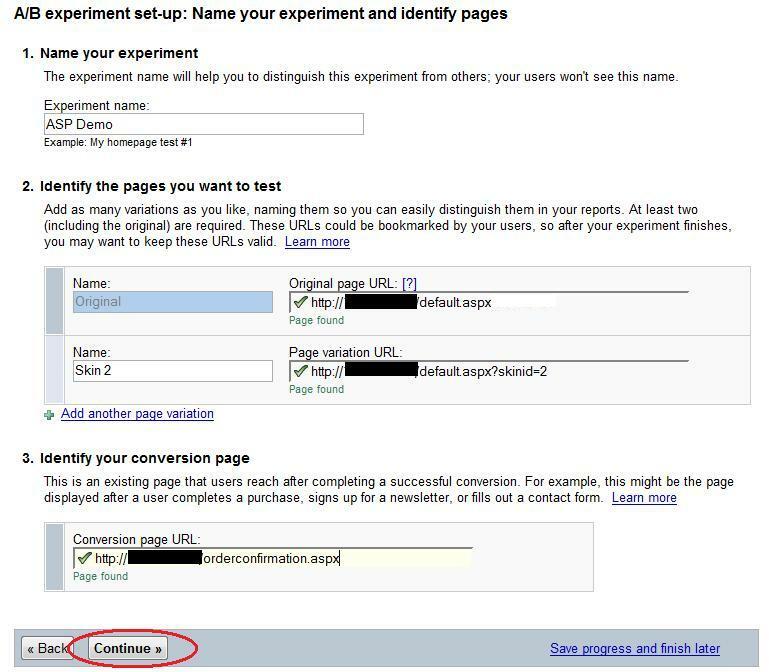 3 - Click the 'Create Experiment' link to start setting up your test. 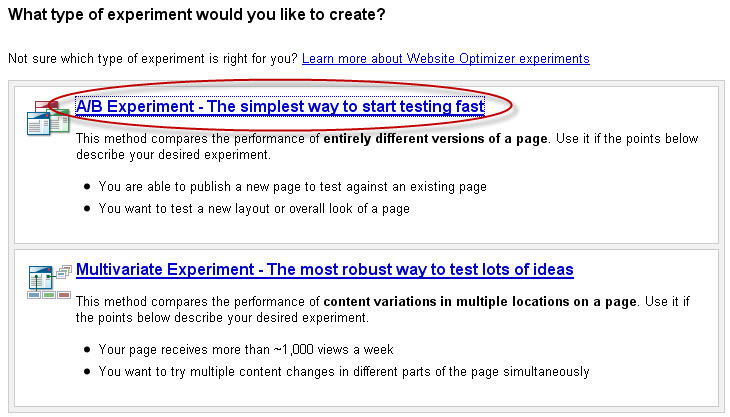 4 - Click the 'A/B Experiment - The simplest way to start testing fast' button. 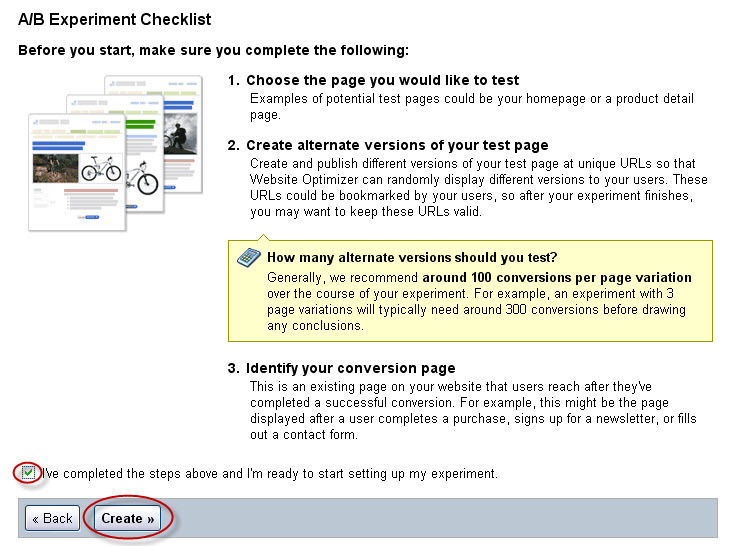 5 - In the A/B Experiment Checklist page, check the box at the bottom of the page indicating that you have done the steps explained in the page. Then click the 'Create' button. 6 - Fill in the required information on the next page, then click 'Continue'. 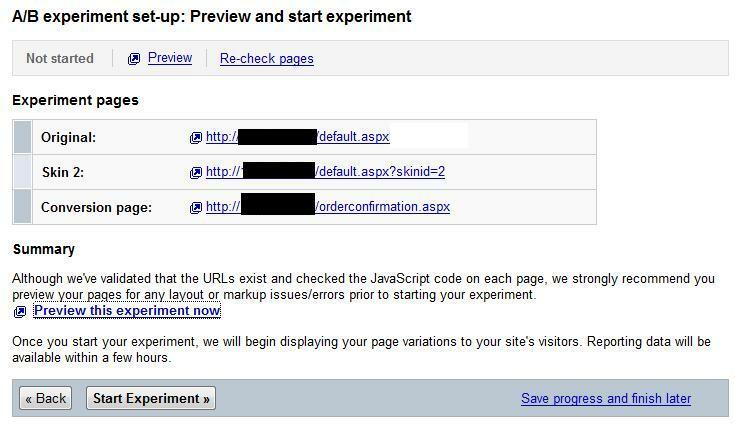 Experiment Name This is just a label that will appear within Google's site so you can tell which experiment you are working with. Customers will not see this name. Conversion Page URL This should be the URL that you are hoping to drive customers to with your new skin. This is almost always going to be orderconfirmation.aspx, as that is the page customers see just after completing a sale. Original Page - The first 2 scripts given need to go in the template.ascx file for the skin # you specified for the Original Page URL above. The first snippet should go just below the tag and the second should be just above the tag. tag) of the template.ascx file for the skin #(s) you specified as Page Variation URL(s) above. Conversion Page - Insert this script into the bottom of the page you specified for the Conversion Page URL above. 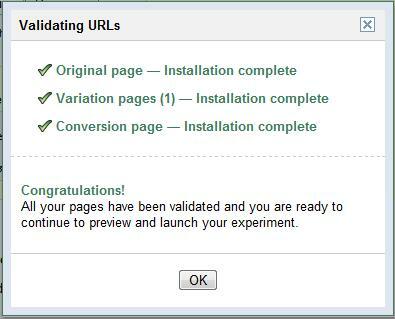 9 - Once the scripts have been inserted into the necessary files, click the 'Validate' button at the bottom of the page and Google will connect to those pages and attempt to verify that they are working properly. NOTE: The conversion page will fail this initial test, and you'll be prompted to click OK and try again. This time, you will have an option to upload the page instead. Use the 'Browse' button to upload the orderconfirmation.aspx.cs file (or other file if you are using a different conversion page) and click 'Validate Again' at the bottom of the page. The validation should succeed this time. 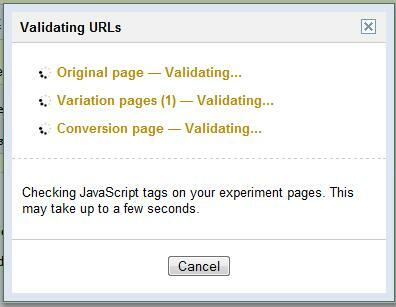 10 - Click OK on the validation popup, and you will see the details of the experiment that you have created. 11 - Click the 'Preview this experiment now' link to preview the pages customers will be sent to. Use the 'Show' dropdown at the upper left to switch between your skins. 12 - If everything looks as intended, close out the preview and click 'Start Experiment'. Customers will immediately begin seeing the different versions of your storefront and results should be available in your Google account within a few hours.